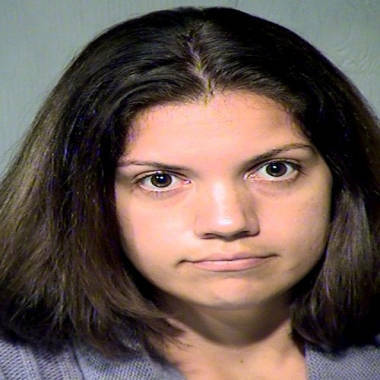 Jami Lynn Toler, 27, faked having breast cancer so she could have her breasts augmented, according to Arizona police. A Phoenix woman accused of pretending to have cancer to raise money for breast implants was sentenced on Wednesday to one year in jail, local media reported. As part of a plea agreement, Jami Lynn Toler, 27, will also get three years’ probation and pay restitution, The Arizona Republic reported. "I am so sorry for violating the trust placed in me and so sorry for what I did," Toler said at her sentencing, according to kpho.com. Toler pleaded guilty in Maricopa County Superior Court last month to theft. According to prosecutors, Toler told her family, friends and co-workers at Hallmark Hospice that she had breast cancer and needed money for a double mastectomy and breast reconstructive surgery. Toler's mother created a website for donations, and police said people donated more than $8,000 to the cause beginning in 2011. According to court records, Toler paid a doctor $5,800 cash for breast augmentation surgery that was performed Nov. 15. Staff at her workplace became suspicious when she couldn't provide a doctor’s note for her medical leave, according to wptv.com. Medical records later obtained by police show she didn't have cancer.